Alexis Sanchez scored twice against Hull City with one of the goals clearly coming off the Chilean's hand. Arsenal put two Premier League defeats – and days of uncertainty about manager Arsene Wenger – behind them to post a workmanlike 2-0 victory over Hull City that lifted them above Manchester City into third place. With none of the other top four teams playing on Saturday afternoon, Manchester United beat Watford 2-0 to move ahead of Liverpool in fifth place and Southampton’s new striker Manolo Gabbiadini scored twice in their 4-0 thumping of Sunderland. However welcome Arsenal’s victory was, it owed much to luck after a controversial handball goal from Alexis Sanchez and did little to lift the mood at the Emirates where Wenger was non-committal about his future. The game turned on Sanchez’s 34th-minute opener when the ball went into the net inadvertently off the Chilean’s hand after popping up from a goalline save by the keeper. Sanchez’s second also came via a goalline handball, this time from Hull’s Sam Clucas in stoppage time, which led to a penalty and sending-off. 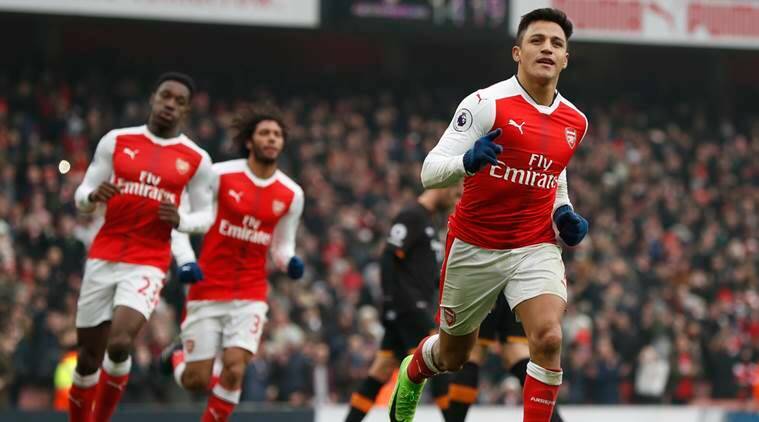 Sanchez’s spot-kick took his tally to 17 goals in 25 league games, including four against Hull. At Old Trafford, Manchester United looked unrecognisable from the side who spluttered through the early months of the season and extended their unbeaten league run to 16 games. Anthony Martial responded to a rare start with this third goal of the season after Juan Mata had given United the lead. The win put United one point behind fourth-placed Manchester City, who play on Monday. Elsewhere, Southampton are getting an instant return on the 14 million pounds ($17.5 million) they paid Napoli for Italy striker Gabbiadini on transfer deadline day, and his brace, including a brilliant turn and shot, means he has now scored three in two games. A week remains a long time in football and two more late goals for Southampton left Sunderland on the wrong end of the same 4-0 result they inflicted on Crystal Palace seven days earlier. Sunderland and Palace remained rooted to the bottom on 19 points after Joe Allen’s sixth league goal of the season for Stoke – his best-ever haul – was enough to see off Sam Allardyce’s side 1-0. With Middlesbrough taking a point from a 0-0 draw with Everton, the day’s real winners at the bottom were Swansea City and Leicester City, neither of whom played. Saturday’s other afternoon game saw West Bromwich Albion secure a 2-2 draw at West Ham United thanks to a controversial stoppage-time equaliser. Home manager Slaven Bilic and his assistant were both sent off. Liverpool host second-placed Tottenham Hotspur in the late game. Leaders Chelsea, nine points clear at the top, play at Burnley on Sunday.